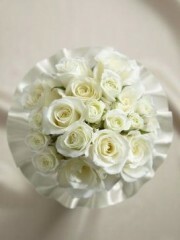 A collection of nature's finest white blooms to help you say your "I Do's" in style. 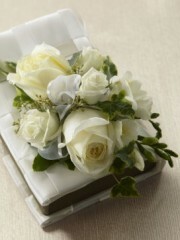 White roses, cymbidium orchids, hydrangea, and stephanotis are accented with a variety of lush greens and tied together at the stems with an ivory woven edge grosgrain ribbon to create a bouquet full of interest and appealing texture. Approx. 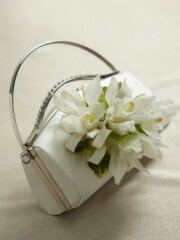 12"H x 13"W.
This elegant handbag corsage turns your simple wedding clutch into a memorable accessory. 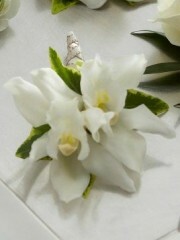 Mini cymbidium orchid stems are arranged with variegated ivy vines and accented with an ivory taffeta ribbon to create a wonderful way to add that extra touch to your wedding day. Approx. 4"H x 6'W. 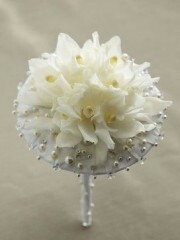 Our Eternal Romance Bouquet has a dream-like appeal that will be the perfect accessory on your wedding day. Pretty white ranunculus, roses, freesia, mini calla lilies, peonies, spray roses and hydrangea are brought together in this exquisite arrangement with lush greens and tied together with an ivory satin ribbon. 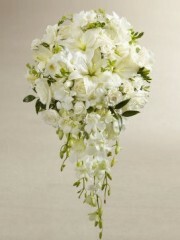 This beautiful cascade bouquet is a stunning way to make an entrance on your wedding day. 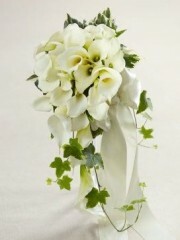 Fabulous open cut white calla lilies and white mini calla lilies take centerstage accented with variegated ivy and a sugar pearl circle bouquet buckle. 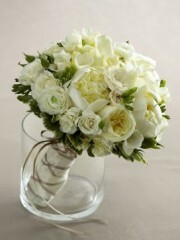 With the stems wrapped in an ivory satin ribbon to finish the look, this bouquet is both dramatic and demure. This is the perfect bridal gift on her wedding day. 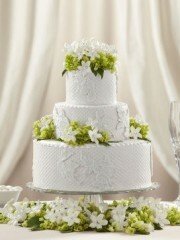 A petite and very beautiful bouquet of white roses, freesia, spray roses and lush greens are elegantly arranged on top of a bible accented with a basket weave pattern of white satin ribbon. A gift they will always hold dear. Approx. 11"H x 6"W.
White is the traditional colour preference when it comes to wedding flowers and with good reason – this colour is not only elegant but also emphasises the beauty of this truly marvellous ceremony. There are many beautiful white flowers ranging from white roses to tulips; different types of lilies like calla and oriental; gorgeous chrysanthemums; lovely lisianthus; freesias; orchids to name some. 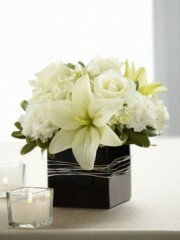 All of these flowers are beautiful on their own as well as part of an arrangement. Inverness flowers uses only the best quality flowers which have been imported all the way from Holland, the western region of the Netherlands. Combined with up to four deliveries per week from the Dutch cultivators, the flowers are not only of the best quality but they are also the freshest meaning they will stay absolutely beautiful throughout the entire wedding day. Up on the Inverness flowers website you can have a browse through the elegant whites wedding collection to see if anything appeals to you. 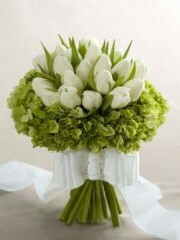 Don’t worry if nothing is fully to your liking as there is a bespoke service available at Inverness flowers. 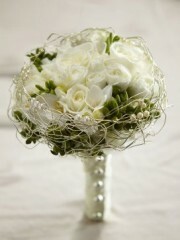 This service enables you to work with the Inverness florists to create the perfect wedding flower arrangements for you. You can specify what flowers you would like, the colour schemes, what flowers to avoid and what sort of floral designs you would like. Once all of this information has been acquired, the Inverness flowers team will create something that fully reflects all of your ideas. For further information about the bespoke service or any of the services provided by Inverness flowers, please do not hesitate to get in touch. You are able to contact Inverness flowers either by phone or email as there is always someone on hand, ready to answer any and all of your queries. 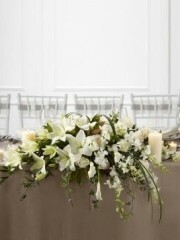 Once you have selected your colour scheme, you must choose what sort of floral designs you need for your wedding. As your wedding is a special occasion, it has to be picture perfect and flowers play an important part in the wedding ceremony. 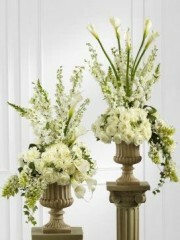 There are several floral designs to consider when selecting your flowers. 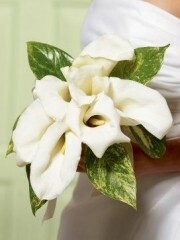 For the bride herself, there is the bridal bouquet to keep in mind as well as any flowers she might wish to wear such as decorations for the veil or a corsage. 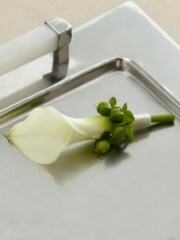 For the groom, a buttonhole to compliment the suit. 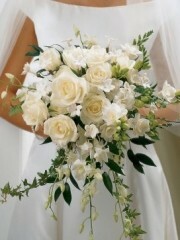 Then there are also the bridesmaids and groomsmen – complementary bouquets and buttonholes which compliments their outfits. There are also the flower girl and ring boy to keep in mind: the flower girl will be scattering lovely flower petals down the aisle for the bride and the little ring boy can also have a sharp little buttonhole to finish off his suit. Once the people partaking in the ceremony have been catered for, there is also the actual venue to keep in mind. Inverness flowers have a lovely range of centrepieces on offer which can be placed on the tables or down the aisle as well as designs such as cake decorations and so on. No matter what it is you’re after, Inverness flowers want to assure you that we do everything we possibly can to accommodate to all different tastes and needs. Please do not hesitate to book a wedding consultation as there is an experienced florist available to talk through the possibilities and all of your ideas so you are able to receive flowers nothing short of perfection for your wedding day.